Download "Bicycles Prime Movers: Internal/External Obliques/Side ABS. Candlesticks Prime Movers: Rectus Abdominis/Lower Upper ABS"
1 Abdominal Exercises Spider Strength and Conditioning 1 Bicycles Prime Movers: Internal/External Obliques/Side ABS 1. From a crunch position with the feet off of the ground and legs straight out. 1. Extend the left leg straight out and simultaneously pull the right knee towards the chest touching the left elbow to the right knee. 2. Then perform the same movement for the opposite side. 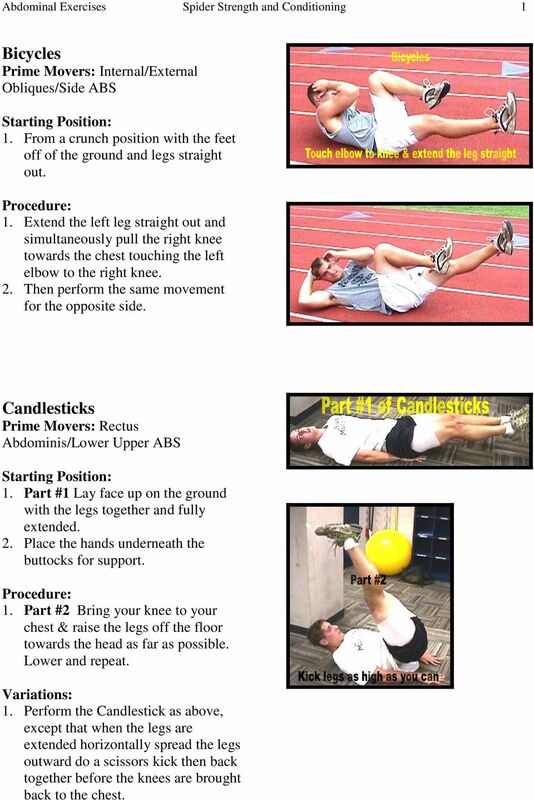 Candlesticks Abdominis/Lower Upper ABS 1. Part #1 Lay face up on the ground with the legs together and fully extended. 2. Place the hands underneath the buttocks for support. 1. Part #2 Bring your knee to your chest & raise the legs off the floor towards the head as far as possible. Lower and repeat. Variations: 1. Perform the Candlestick as above, except that when the legs are extended horizontally spread the legs outward do a scissors kick then back together before the knees are brought back to the chest. 2 Abdominal Exercises Spider Strength and Conditioning 2 Flutter Kicks Abdominis/ Lower ABS 1. Lay face up on the ground with the legs held together and fully extended. 2. Place the hands under the buttocks for support. 1. Raise the legs off of the floor 4-6 inches and raise the head and shoulders off of the ground slightly to help keep the low back flat. 2. To perform the exercise, slowly kick back and forth similar to swimming. 3. DO NOT touch the heels to the ground. 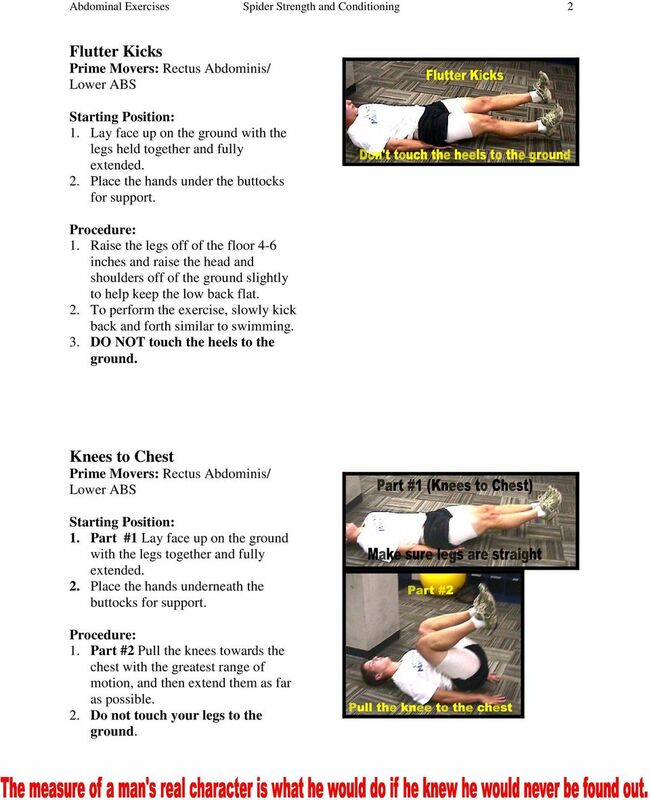 Knees to Chest Abdominis/ Lower ABS 1. Part #1 Lay face up on the ground with the legs together and fully extended. 2. Place the hands underneath the buttocks for support. 1. Part #2 Pull the knees towards the chest with the greatest range of motion, and then extend them as far as possible. 2. Do not touch your legs to the ground. 3 Abdominal Exercises Spider Strength and Conditioning 3 Leg Lifts Abdominis/ Lower ABS 1. Perform the same way as the Flutter Kick, except keep the legs together at all times. 1. Raise the legs to a starting position 6 inches off of the ground to an ending position 8 inches off the ground. 2. Be sure to keep the low back flat against the ground to protect the lumbar spine. Lotus Flowers Abdominis/Upper ABS 1. Lay face up on the ground with the feet off of the ground as when doing a crunch. 2. Put the soles of the feet together. 1. With the arms extended perform a crunch upward touching the fingertips to the shoelaces. 2. Return to the starting position and repeat. 4 Abdominal Exercises Spider Strength and Conditioning 4 Side Crunch Prime Movers: Internal/External obliques/side ABS 1. Begin in a crunch position with the feet flat on the floor. 2. Roll the knees to the left until they touch the floor. 1. Perform a crunch trying to touch the right elbow to the right hip. 2. Return to the starting position and repeat. 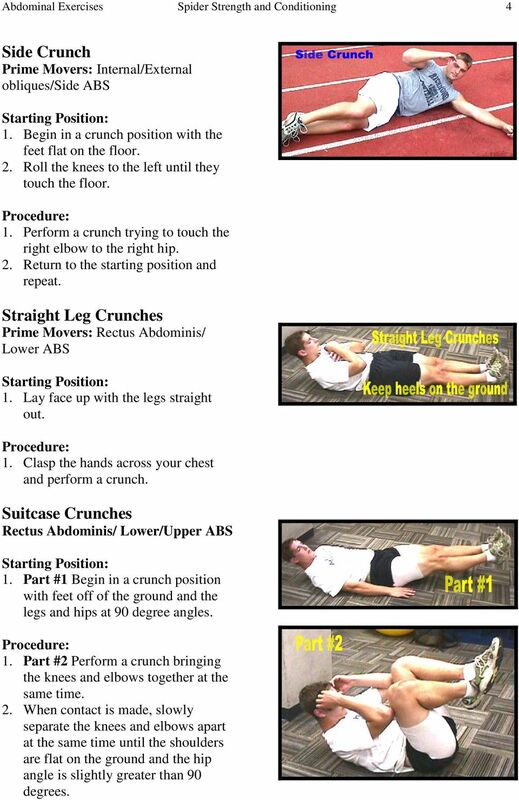 Straight Leg Crunches Abdominis/ Lower ABS 1. Lay face up with the legs straight out. 1. Clasp the hands across your chest and perform a crunch. Suitcase Crunches Rectus Abdominis/ Lower/Upper ABS 1. Part #1 Begin in a crunch position with feet off of the ground and the legs and hips at 90 degree angles. 1. Part #2 Perform a crunch bringing the knees and elbows together at the same time. 2. When contact is made, slowly separate the knees and elbows apart at the same time until the shoulders are flat on the ground and the hip angle is slightly greater than 90 degrees. 5 Abdominal Exercises Spider Strength and Conditioning 5 V-Sit-ups Abdominis/Upper-Lower ABS Part #1: Lay face up on the floor with legs extended and arms straight overhead. 1. Part #2: Bending in the abdominal region, raise both upper and lower body simultaneously off of the ground until the hands and feet meet. 2. End up in a pike position with the only point of contact with the floor being at the upper part of the buttocks. 3. Simultaneously lower the upper body and lower body to the ground. Variations: 1. Can be done with a Med Ball in your hands our between your feet or both. 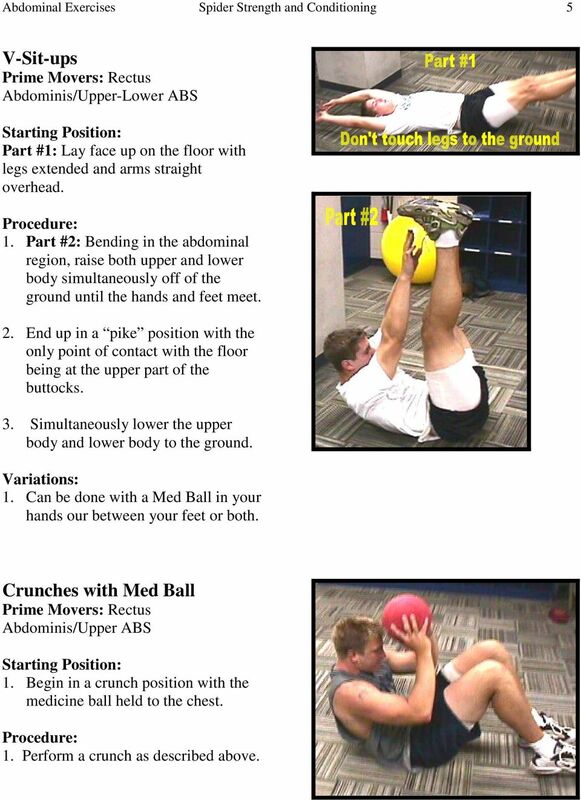 Crunches with Med Ball Abdominis/Upper ABS 1. 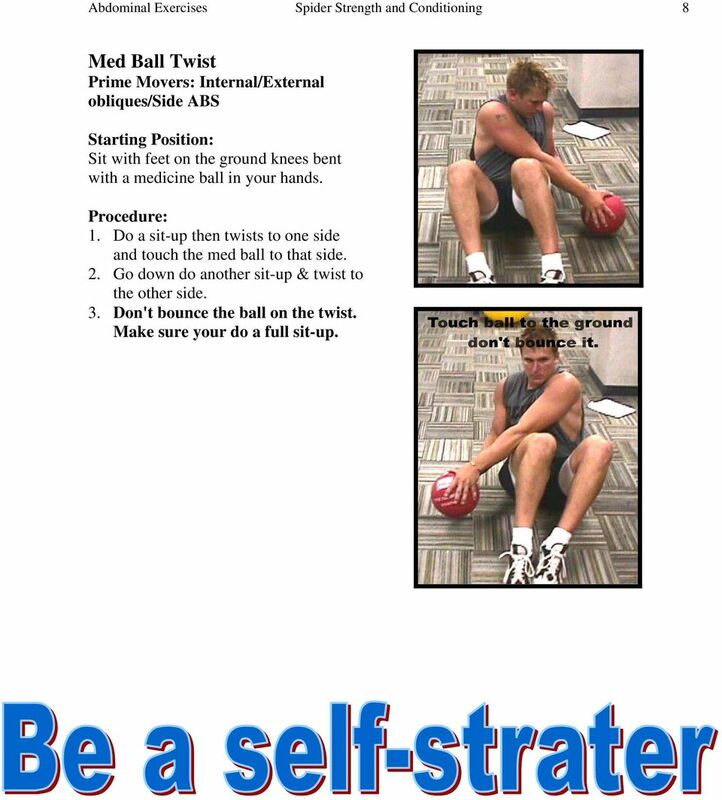 Begin in a crunch position with the medicine ball held to the chest. 1. Perform a crunch as described above. 6 Abdominal Exercises Spider Strength and Conditioning 6 Leg Lifts with Med Ball Abdominis/Lower ABS 1. Lay flat face up on the floor with a medicine ball between the ankles. 2. If that is too much resistance place the ball between the knees. 1. Perform the Leg Lift exercise described above for the required amount of repetitions. Moving Med Ball Grabs Prime Movers: Internal/External obliques/side ABS 1. Begin in a sit up position with a second athlete standing on the feet for support. 2. The second athlete holds the medicine ball in any location. 3. 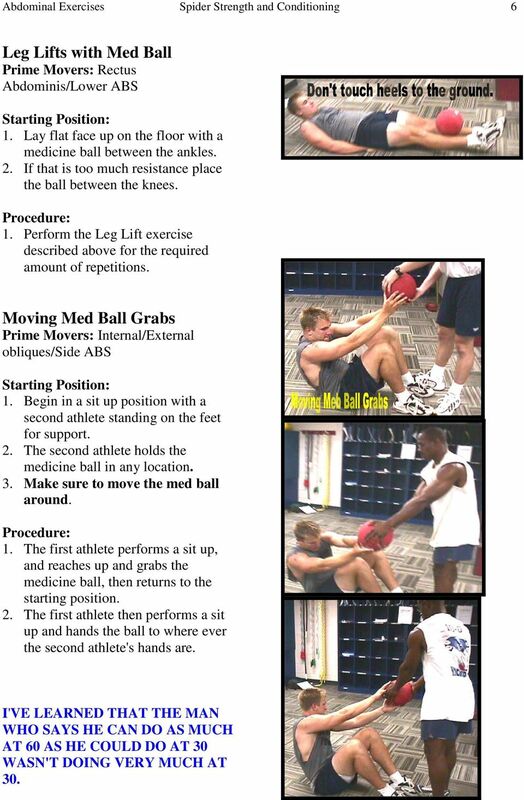 Make sure to move the med ball around. 1. The first athlete performs a sit up, and reaches up and grabs the medicine ball, then returns to the starting position. 2. The first athlete then performs a sit up and hands the ball to where ever the second athlete's hands are. I'VE LEARNED THAT THE MAN WHO SAYS HE CAN DO AS MUCH AT 60 AS HE COULD DO AT 30 WASN'T DOING VERY MUCH AT 30. 7 Abdominal Exercises Spider Strength and Conditioning 7 See-Saws Abdominis/Upper-Lower ABS 1. 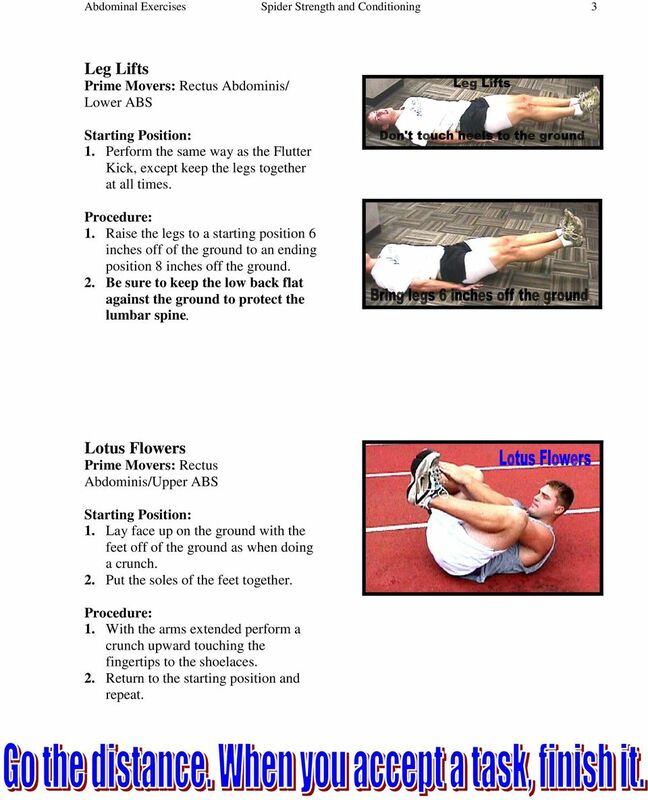 Begin with both athletes facing each other in a sit up position, with legs locked at the feet and ankles. 1. One athlete holds the medicine ball above the forehead lying in the down position. The other one begins in the up position. 2. The athlete with the medicine ball then sits up, throws the ball above your partner's head and then goes back to the down position. 3. The athlete with the ball now lowers the upper body to the floor, and then goes back to the up position. Sit Up Ball Throws Abdominis/Upper-Lower ABS 1. One athlete begins with the medicine ball overhead laying face up in a sit up position. 1. The athlete performs a sit up and throws the medicine ball as hard as possible to another athlete standing five yards away. 2. 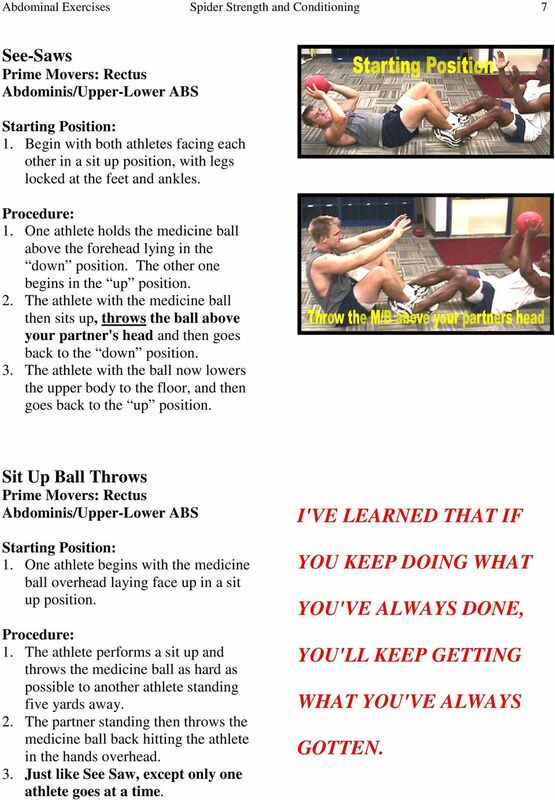 The partner standing then throws the medicine ball back hitting the athlete in the hands overhead. 3. Just like See Saw, except only one athlete goes at a time. I'VE LEARNED THAT IF YOU KEEP DOING WHAT YOU'VE ALWAYS DONE, YOU'LL KEEP GETTING WHAT YOU'VE ALWAYS GOTTEN. 8 Abdominal Exercises Spider Strength and Conditioning 8 Med Ball Twist Prime Movers: Internal/External obliques/side ABS Sit with feet on the ground knees bent with a medicine ball in your hands. 1. Do a sit-up then twists to one side and touch the med ball to that side. 2. Go down do another sit-up & twist to the other side. 3. Don't bounce the ball on the twist. Make sure your do a full sit-up.